The Design & Construction Department's mission is to provide engineering services for all types of highway-related facilities, with a highly skilled professional team working together, using technical knowledge, common sense and practical experience. Design & Construction is responsible for the administration and implementation of the District’s engineering, design and construction programs. Design & Construction provides engineering services essential to support internal and external maintenance and construction operations, including in-house survey and design work, construction project inspection, construction materials quality assurance, and construction contract administration. The Construction Section administers the District's construction project program. Project inspectors and materials testing technicians ensure that work performed by contractors for District capital projects meets strict District standards. To achieve these objectives, the Construction Section maintains a dedicated team of technicians to handle the management, inspection, and testing needs for contracts, projects, and bridges. Professional engineering consultants and private materials testing companies are utilized to supplement specific needs. This partnership with private industry helps Construction ensure that quality construction takes place on all District construction projects. The Design team produces in-house designs for Capital Improvement and Maintenance projects. Design also provides drafting and design services to other ACHD departments and offers technical support and expertise related to consultant design review, bridge repairs/rehabilitation/replacement and pavement overlays. Projects range from simple sidewalk projects to complex road and intersection projects. 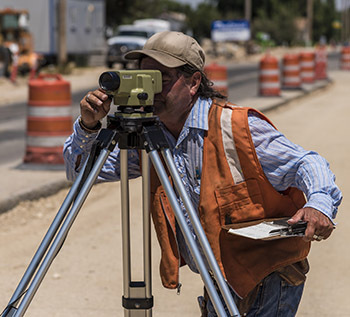 ACHD's Survey team performs topographic surveying in coordination with the design of ACHD projects, as well as construction staking for the myriad of projects ACHD undertakes. They also write legal descriptions for right-of-way acquisitions by the District. Survey support is performed on all ACHD projects and is one phase of the construction inspection.